If you were lucky enough to buy a Moto 360 from the initial batch on Friday before they sold out, then you are probably due to receive your watch within the next day or so. 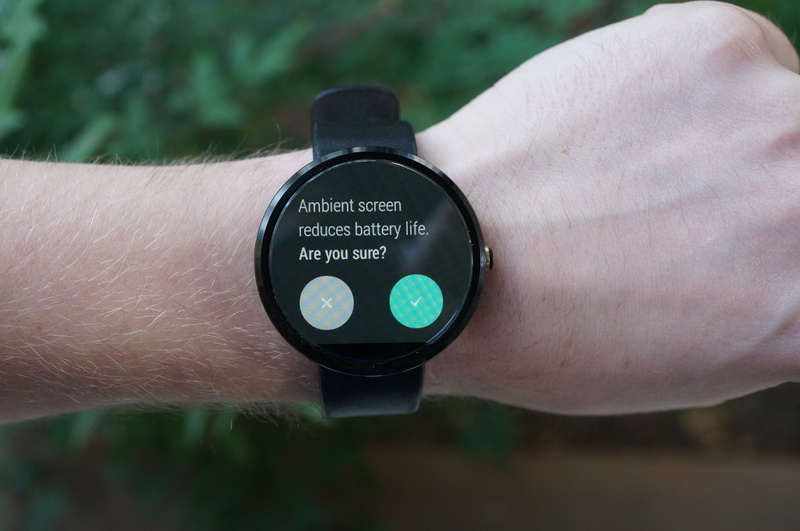 Shortly after you first power it on, set it up through the Android Wear companion app, and then choose which notifications you would like to buzz through to your wrist, there is one critically important system setting you need to decide on leaving off or turning on. That setting is Ambient Screen Mode. 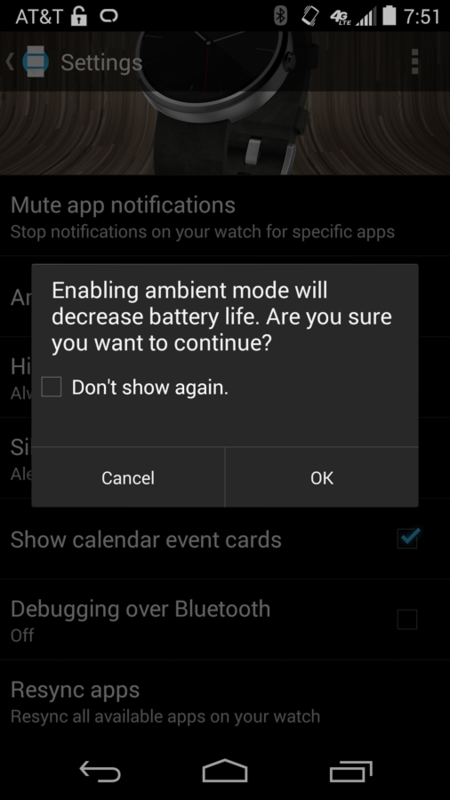 With Ambient Screen mode “on,” the device’s screen turns dim (but still on) within a few seconds, but then may stay dimly lit for an extended period of time. I tried to time a full timeout to black with Ambient Screen on and was over 5 minutes of screen-on before a notification cruised through and ruined my test. Think if your phone’s display stayed on for more than 5 minutes at a time after uses? How long would you expect it to last in a day? With the mode “off,” your watch’s display goes fully black and off within seconds. You can find the option in Settings. Yes, you will be warned about it potentially destroying battery life. So the decision is this – turn Ambient Screen “on” and enjoy a watch that acts and looks a lot more like a traditional watch would, or leave it “off” and enjoy more-than-a-day battery life. The Ambient Screen setting is turned off by default out of the box. That’s probably a good thing. In my testing thus far, I was able to kill my Moto 360 completely (as in it completely powered off) in about 13 hours of use with Ambient Screen turned to “on.” That’s not good enough. If you were to take your 360 off its charger in the morning, go to work, use it throughout the day, and then arrive home roughly 12 hours later, your 360 would be on its last ounces of juice. If you decide to go out for the evening, your 360 more than likely won’t make it through the night. With Ambient Screen turned to “off” I have had much more respectable results. In two full days of using the mode “off” I haven’t had to worry about the watch turning into a useless-but-fancy black screen before I turn in for the night. One night, I was at around 28% after 14 hours of use. The other, I was sitting at about 34% after about 16 hours of use. The only real drawback to having Ambient Screen turned to “off” is the fact that you have to rely on Motorola’s sensor magic to recognize every time you twist your wrist to look at your watch. Motorola has done a solid job of tuning the device to turn the screen on with the correct wrist gesture, but it’s not 100% perfect. There are times where you will still need to tap the screen or press the side button in order to turn the display on. That’s not a deal breaker by any means if you want your watch to last throughout a full day. Again, the choice is yours. Do you want all-day battery life or potentially, much less?